Everyone around the world knows about the Las Vegas Strip. But does everyone know it isn’t in Las Vegas? Nor is the main campus of the University of Nevada, Las Vegas. Or the Las Vegas Convention Center. Or even the famous “Welcome to Fabulous Las Vegas” sign, a photo of which graces the top of this blog. The about-to-be-built stadium for the NFL’s transplanted Las Vegas Raiders? Fuggedaboutit. 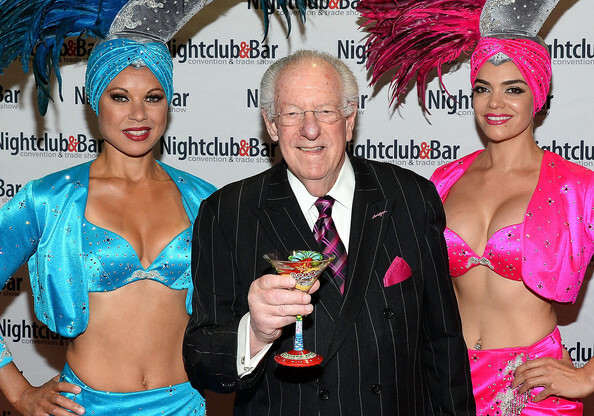 You may have seen over the years any number of photos, like the one gracing this post, of mob-lawyer-turned-Las-Vegas-mayor-turned-retiree Oscar Goodman sipping a cocktail in the presence of Strip showgirls. You might think he had some official jurisdiction and authority over the Strip. You would be wrong. There’s even a pretty good chance such photos weren’t taken in Las Vegas or the Strip (this one from 2014 certainly wasn’t). The post office aids this charade. It allows many addresses in unincorporated Clark County, a land mass bigger than Delaware and Connecticut combined, to say they are in world-famous Las Vegas rather than, say, the unincorporated townships of Paradise (the area to which I moved after becoming New To Las Vegas that also includes most of the Strip, UNLV and the proposed stadium) or Winchester (another area that contains part of the Strip). All the locals know this, of course, but, I suspect, few of the visitors. There’s some interesting history here. The Strip is a 4.2-mile-long portion of Las Vegas Boulevard South running in a southerly direction from Sahara Avenue to Russell Road, next to the airport where the Las Vegas welcome sign draws thousands of tourists daily for photo ops. As it happens, Sahara Avenue is the southern boundary of the City of Las Vegas. The city runs for miles and miles north, east and west–but not south, so there is no overlap with the Strip. The City of Las Vegas was founded in the middle of the unpopulated Mojave Desert in 1905 when corrupt tycoon and U.S. Senator (from Montana) William A. Clark Sr. needed a division point with water for the San Pedro, Los Angeles and Salt Lake Railroad he was building. The city was formally incorporated in 1911 two years after Clark’s name went on the county. By 2000, Las Vegas had become the most populous U.S. city founded in the 20th century (Chicago, in case you wonder, had that honor for the 19th century). The Las Vegas population today, 640,000, is about one-third of the 2 million people living in the greater Las Vegas metropolitan area, which includes the Las Vegas Valley. Nevada legalized casino gambling in 1931. Most of the early gambling halls were clustered around the train station in downtown Las Vegas on Fremont Street (named for a war criminal) and along what came to be known as Las Vegas Boulevard. Downtown Las Vegas continues to be a major center of gambling. But starting in the 1940s new casino operators–i.e. mobsters–wanted to open lavish resorts with more land and facilities (and with questionable financing). They also wanted to get away from what some thought were Las Vegas taxes that were too high. Hey, even organized crime was sensitive to overhead. So the thugs started building outside the city limits along Las Vegas Boulevard South, south of Sahara Avenue, which back then was called San Francisco Avenue. At the time it was an empty stretch of desert. But boy did that change. Eventually, the Strip got all the big-name casino hotels and all the fame. Caesars Palace, the Flamingo, the Bellagio, Wynn/Encore, Venetian, Palazzo, Mirage, MGM Grand, Tropicana, Mandalay Bay, Luxor, Cosmopolitan, Treasure Island, Bally’s, to name but a few today. Another effort came in 1975 when the state Legislature passed a law merging the City of Las Vegas and Paradise, where most of the Strip is. By that time the mob with its offers that couldn’t be refused was largely gone from the Strip. Still, the Nevada Supreme Court struck that down as unconstitutional. The tax issues remain significant. Property taxes go up 20% or so when land in unincorporated Clark County is annexed by the City of Las Vegas. In the past year Las Vegs has annexed something like seven square miles. One result of this is a crazy quilt pattern on the northwest side of Las Vegas, where one parcel might be in the city but the next one not. There are actually 12 square miles of unincorporated Clark County completely surrounded by City of Las Vegas territory. But not along the Las Vegas Strip. Which, by the way, is way cooler than calling it the Clark County Strip, or even the Paradise Strip, which also seems a little creepy.